The CSX network blankets the eastern United States with routes inherited from some of the great names in American railroading, like the Seaboard Coast Line, Chessie System and Conrail. Industries throughout the east rely on tank cars like these to keep their plants stocked with raw materials. Working fill and drain. 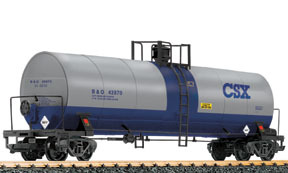 This two-axle tank car continues the “Henkel” branded series of previous years. Just like the other cars in this series, this car features sophisticated printing and decoration. Diamond Alkali joined with Shamrock Oil & Gas in 1967 to form Diamond Shamrock, the Texas oil giant. With this sleek, modern tanker move petrochemicals across your own empire. Working fill and drain. 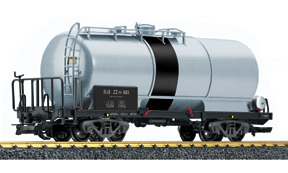 This two-axle tank car is the latest in the popular “Henkel” series of LGB models and a must for your collection. Just like the other cars in this series, this twin-axle model features lavish printing and detailing. The Steiermärkische Landesbahnen (StLB) is a network of narrow gauge lines in the Austrian state of Styria. 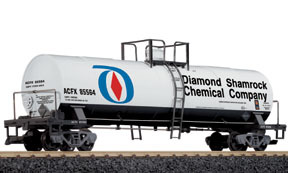 Use this heavy-duty tanker with any of the LGB Austrian locos and rolling stock. The Rhaetian Railroad has over ten of these four-axle tank cars. They are used to transport petroleum oil products. The filler hatch and the valve for emptying the car can be opened. The tank can be filled and emptied … just like a real tank car!